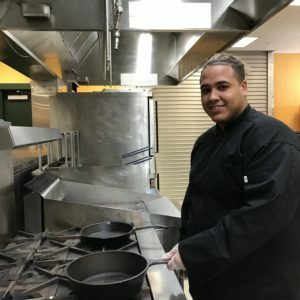 For Jerry Soriano, the Food Bank of Delaware’s Culinary School has been much more than attending classes and going to school; it is one of the most positive experiences in his life. When this Dover resident first learned about the Culinary School in Milford, he had a part-time job and was attending Delaware Tech’s Terry Campus in the graphic arts program. But he was struggling. While he enjoyed learning about graphic design software, that job was less than satisfying, and he was not working enough hours to pay his bills. Fortunately, he ran into his cousin in a convenience store, and Jerry immediately noticed his cousin’s chef jacket. Jerry’s cousin, who was enjoying the Food Bank’s Culinary School program, said he wanted to open his own food business, and also suggested that Jerry apply to the program as well. Jerry did! In fact, he came to the Milford site and met with Ruthann Messick, Workforce Training Program Manager, and Chef Tish, a chef instructor. In addition to helping him enroll in the next Culinary School program, they helped him apply for a full-time job at Dover Downs Hotel & Casino. The Culinary School is a 14-week program for people in transition to learn basic and high-end kitchen skills, ServSafe training, and life skills. The program includes 12 weeks of kitchen and classroom instruction, culminating with a 2-week paid internship. Ruthann reports that Jerry has been a positive member of his class. “Jerry is eager to learn in class. Because of his ability to learn new concepts and take directions well, we were able to place him in employment early in the program,” she said. Even before he started class, Jerry said the interaction with The Culinary School was positive, starting with an opportunity for more rewarding employment. “I got a call the next day,” said Jerry. He landed the job as part of the banquet prep team, so he’s getting on-the-job training while attending school. “It’s full time, and the benefits are awesome. The people there are very nice too,” he said. He hasn’t completely put aside his interest in photography and graphic design. “It’s still something I love to do, and I might do some photo shoots,” he said. But he’s looking forward to his Culinary School graduation on April 23, and he knows he will continue to improve his culinary skills by taking advanced classes taught at Dover Downs. “They are chef taught and hands on,” he said. Meanwhile, Jerry has become quite the ambassador for The Culinary School, sharing the value of the program with friends. “I like this. It’s a stepping stone for people in rough situations. There is no obstacle from attending but yourself. They even help with transportation,” he said. Click here to learn more about The Culinary School and how to enroll.